Want to know some pretty cool Mexican last names? Here are some last names for you to choose from. When the Spanish conquistadors completed the colonization of Latin America, they completely imposed their culture, norms and traditions on Latin America. And amongst other Mexican things which find their origins in Spain, are their names, their last names and their naming system. 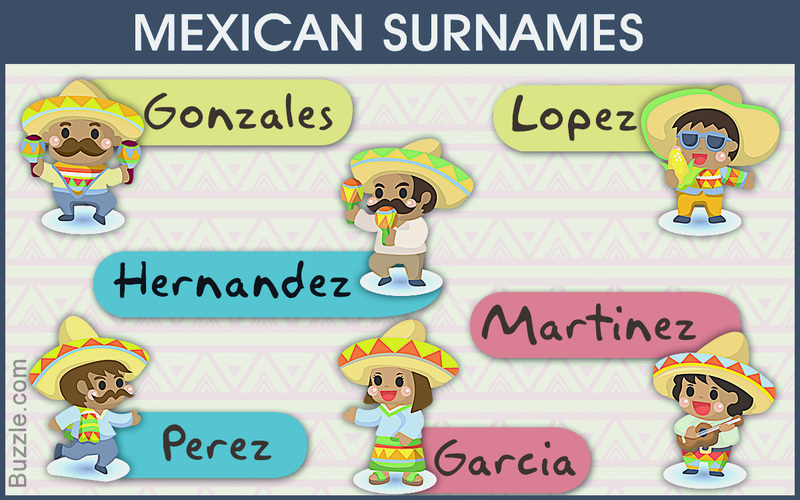 Unlike other cultures, a Mexican (or a Spaniard) has two surnames. While in most cultures, a child takes up the last name of either his mother or his father, a child in Hispanic or Mexican culture is given surnames of both. Traditionally, a child would take the last name of both his maternal and paternal grandfathers, but due to gender inequality issues, that rule has been overrun. Now the child can be given any one of the two surnames his father has and one which his mother has. While for the sake of simplicity, a person may be addressed only with the last name of the father which is kept, the official birth name still has two surnames. Let me explain this with the help of an example. Suppose, Raul Perez (father's surname) Gonzales (mother's surname) and Maria Alonso (father's surname) Lopez (mother's surname) have a son named Francesco, he will adopt the surname of both his grandfathers, i.e. Francesco Perez Alonso. While this is an old tradition, Francesco or his parents may choose to give him one surname one of Perez and Gonzales (father's side) and one out of Alonso and Lopez. It is also interesting to note how Hispanic surnames have developed. Spanish surnames may be derived in several ways. Most often the surnames are patronymic or matronymic. They are derived by using the names of their fathers/mothers and adding the 'ez/es' at the end of the name. Hence 'Sanchez', would mean the son of 'Sancho' and 'Marquez' would mean son of 'Marcos' and so on. Other surnames may be occupational. Thus, a man named Ricardo Guerrera can mean something like 'Ricardo the Warrior', or Lisandro Molinero would mean 'Lisandro the Miller'. Some surnames describe the person in question. Jose Delgado may mean 'Jose the thin one'. Other Hispanic surnames are geographical and bear the name of the place which they are from. In such cases, a prefix 'de' is often added which means 'of'. So Alessandro Alvarez de Cordoba, means that Alessandro's family might be from Cordoba. Well at least the mother's side. Here 's an interesting exercise. Suppose you knew some person named Fernando Ramirez de Ayala. What does it tell you about him? Show Answer The son of Ramiro whose mother is from Ayala! As you can see Hispanic and Spanish last names are quite meaningful and tell you something about the person in question. So wouldn't you love to have one of these Mexican last names?